I have recently undergone a quest to learn how to make lye soap using ashes from a fire and rendered animal fat. Thusfar, my attempts to make soap have been less than successful, but the first step – rendering the fat – I think I’ve got down pretty well. Not that I deserve any credit, mind you, it’s just incredibly easy. The first step is, naturally, to obtain some raw animal fat. 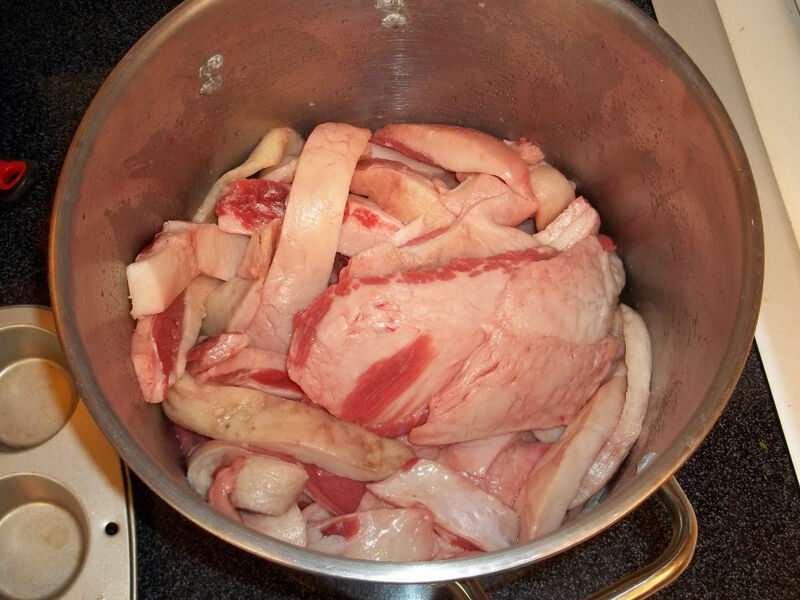 If you are a hunter or chef, this should not be difficult, as you can simply save the bits from whatever meat you process. I, however, had to obtain my fat at the grocery store. Fat is a waste product, and if you ask the local butcher, s/he is likely to give it away or sell it to you for a trivial price. She told me that many people request fat for various purposes, so the best time to ask was during the morning hours. 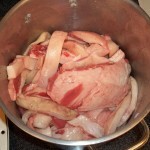 For my project, I bought three pounds of beef fat for $1 from Crest Foods. It’s okay if there are still bits of meat attached. If the goal is to make soap, most of the sources I’ve read agree that it is better not to use softer fats such as those from chicken or pork, but ones that are more solid such as beef, deer, elk, and the like. Many sources will recommend that you cut the fat into small bits, or even grind it, which will hasten the rendering process. The fat that I received from the butcher was already cut into long inch-thick strips, more or less, which rendered fine without extra processing. 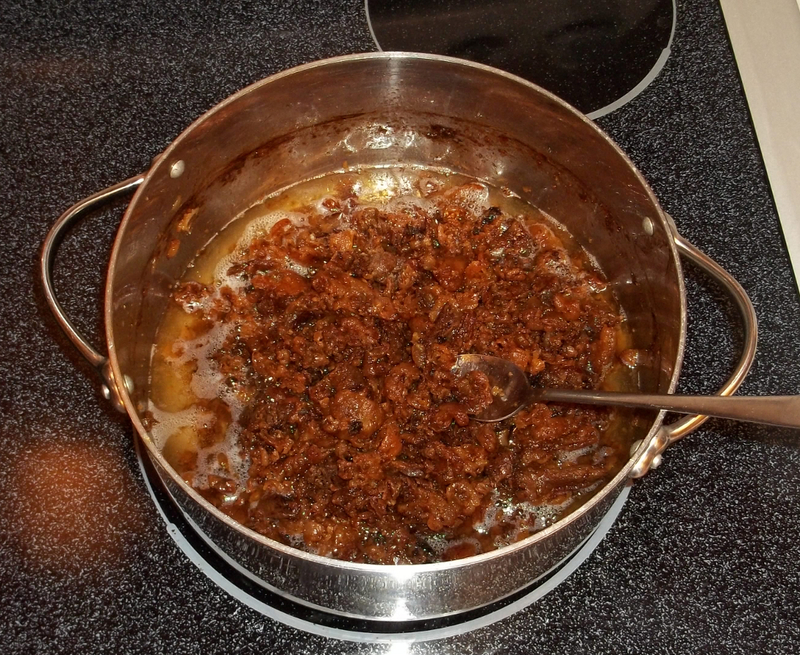 I threw the whole mess of fat into a large pot and put it on the stove on low heat. I added some water to help distribute the initial heat evenly throughout the fat, but this would evaporate before I was finished, not to be included in the final product. 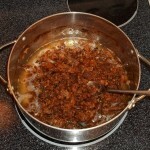 It is not a necessary step, but it may help keep your pot from scorching. 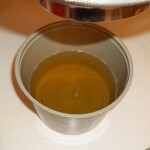 If you wanted to copy this method, half the volume of fat would be plenty of water. After leaving it for some hours, stirring only every so often to pull up bottom-stickers, the pot looked like first picture of this article. I let it continue on for awhile after I could no longer see the “cracklins” shrinking, or detect any fat-like softness from jabbing at it with a spoon. Once I was satisfied with the amount rendered, I carefully poured the liquid fat through a paper towel supported by a wire strainer into an empty butter bucket. I have found that this is an excellent way to filter fats, because particles that are otherwise small enough to pass through the fibers are caused by the fat to be retained in the towel. I used a slightly smaller pot to press down on the cracklins and extract further liquid, again filtering it into the bucket. As you can see in the third picture, the result is a beautiful transparent yellow liquid. 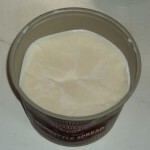 After cooling in the refrigerator, the fat becomes (more or less) white and waxy. This is the finished product, freshly rendered tallow waiting for me to save up enough ashes to make lye water, and hopefully a batch of old fashioned soap. Supposedly, the cracklins are delicious snacks. I did try a few bits, but found myself less than impressed. Perhaps they would be more palatable with some seasoning. Were I in a deficit of calories rather than my current excess (*ahem*) I might consider doing so. But, as it stands, my father’s chickens appreciated them greatly. I could swear they looked a bit bigger the next day.